The Yorkshire Air Museum’s internationally renowned Halifax bomber restoration is named after the legendary Halifax “Friday the 13th”, which flew with 158 Squadron from RAF Lissett, East Yorkshire, completing 128 missions, the highest tally of any Halifax and as such, one of the Bomber Command’s most successful aircraft. On Saturday 16th March, Flt. Sgt. Eric King, the sole surviving member of the crew that gave this illustrious aircraft its distinctive name, visited the Yorkshire Air Museum with members of his family, to once again climb aboard ‘his’ aircraft. The tour had been arranged as a treat to mark his imminent 90th birthday (Wednesday 20th March) and it proved to be a poignant occasion for him and his family. So today, we wish Eric a very hapy 90th birthday and our warmest congratulations! 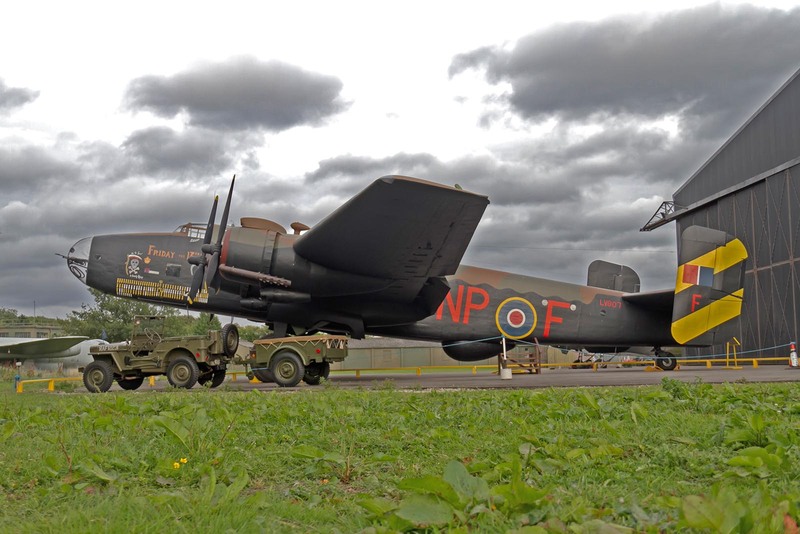 Right from its very first operation on 30th March 1944, Halifax LV907 was to prove to be a ‘lucky’ aircraft. That night, still un-christened, and known as just another F for Freddie, it was Joe Hitchman at the controls, with an assembled crew. It should have been Joe’s night off, but he was called in for this raid on Nuremberg. His Squadron leader had taken his regular aircraft, G for George, out that night but was shot down and lost – it could have been Joe, but fate had had other ideas. Why “Friday the 13th”, surely an unusual name to give an aircraft? The story goes that 158 Squadron had lost seven Halifax aircraft with the registration letter F in succession, within a year. When Halifax LV907 was delivered to the Squadron, it also bore this ‘unlucky’ letter, which had caused many crews to become nervous of flying aircraft with this code letter, and was given to the charge of Pilot Officer Cliff R R Smith and his crew. “Smithy”, in his characteristic ‘stuff and nonsense’ attitude to this fear, decided to break this jinx, by giving the aircraft its ‘unlucky’ title, along with the decals of the Grim Reaper and an upside down horseshoe, which he painted on. It is even noted that an open ladder had been painted above the crew entry hatch, which they would have to pass under to board the aircraft, but it was deemed this would be taking things too far and its removal was ordered. Over the years, several accounts of the naming of the aircraft have given the name of one Clifford MacDonald as the person who named “Friday the 13th”. With Eric King’s visit, this little mystery was solved. It transpires, quite incredibly, that they were one and the same person! “Smithy” had married, and unusually, taken his wife’s surname. So Cliff Smith became known as Clifford MacDonald. The symbolism of the aircraft did prove to be lucky and the aircraft carried a number of crews during its operational life, and indeed Eric completed 29 missions aboard ”Friday the 13th”, gaining the DFM on his 28th outing. In all, Eric completed 39 ops. During his look around the Halifax, Eric recalled his often painful memories of flying into battle. He said that initially, the young crews, all volunteers, were enthusiastic and eager to get to work, but after 5 missions or so, the seriousness of the situation and the peril they faced began to sink in. He regards himself as incredibly lucky to still be alive to make this trip and sit in his old ‘office’, the Wireless Operator position. Pilot Officer Cliff Smith (Clifford MacDonald) – Pilot. From London. Harold King – Navigator. From New Zealand. Keith Smith – Bomb Aimer. Also from New Zealand. Flt. Sgt. Eric King – WOP / Air Gunner. From Ipswich. Rod Neary – Flt. Engineer. From Enfield, London. Ron Clarkson – Mid Upper Gunner. From Australia. Stan Hardacre – Rear Gunner. From Bradford, Yorkshire. Completed 4 ops with the crew, before being overcome with fear and exhaustion. Replaced by Jack Goff, from Romford, Essex. There follows some links to regional press coverage of this story. Clifford Smith was my uncle. He was my father’s brother. The grey fabric elephant he is holding in the photo was made for him by their sister. He changed his name to McDonald when he remarried before he emigrated to New Zealand. I’m also related to Clifford, he’s my great grandfather; and have a lot of documents on him. The elephant is Disney’s dumbo, and it was given to him because of his large ears as a little joke. I have just discovered a picture of Friday 13th with its full air and ground crew posing on a runway. The nose art and mission tally all confirm the identity of the aircraft. My great Uncle F/O Harold Wheeler is identified as the pilot. The rest of the aircrew and ground crew are identified by rank and name. The some of the servicemen could have been Canadians serving in the RCAF. Can you tell me more about the airplane and my great uncle? Hi Trudy, I have just seen your request for information about your great uncle and the bomber he flew in WWII on the Yorkshire Air Museum’s website. I am afraid that I don’t have any info on your relative but I do have some documents and photos of the bomber, ‘Friday the 13th’, that I have gathered over the last few years which might be of interest to you. My husband’s granddad was a Flight Engineer in the crew listed on the website. The plane itself was deemed as being significant enough that after the war it was displayed along with some other planes and vehicles outside the partly bombed out John Lewis department store in Oxford Street, London. I have some info and photos of that event too. Get in contact if you want any of this sending to you, I am happy to do this via email if you reply to this message. My dad was a navigator with 158….I remember him telling me about ‘Friday’ being on display in Piccadilly Circus, and that he was on duty to show people around it. I would love to see the photo you have of Friday 13th with ground crew. My father was a mechanic at Leconfield who gave “F for Freddy” its first service before it was transferred to another base. He revisited “Friday 13th” a few years ago. I’d be interested for any further info you can offer. My father will be 92 at the end of this month and any of his war years memorabilia is very special to him. Thanks. I’m sure my dad got in contact with Harold Wheeler when he was searching for members of his old crew. How lovely. What a marvel to see Friday the 13th in such immaculate state. Nearly 20 years ago the late Mr.Bob Davies Sqd/Ldr ret., the late Edward Muijsers and I visited the YAM, when the fuselage was still under reconstruction in a shed. I was allowed entrance in the (then) empty fuselage, which gave me a once in a lifetime idea how narrow the crew was accommodated. We brought some pieces of Halifax Mk.III (NA616) of 347 Sqdn.RAF, lost on 3rd September 1944 near ‘our’ Venlo airfield during the very same bombing raid which finished off the operational life of this Luftwaffe nightfighter base. The late and unforgetable Mrs. Betty Harris guided us along all premisses at the YAM. We donated a few bricks to support the T2 hangar project. We didn’t say farewell before Bob, Ed and I made a (nearly) take off scramble on the YAM runway in Bob’s 8 cylinders Pontiac Firebird. I will always cherish these beautiful memories ! My dad was a Navigation Officer and flew in Friday 13th, he was awarded the DFM. He also flew in Lancasters. I would like to know if there is any photographic evidence of him on Friday 13th. For 3 years, I worked with Alfred (Alf) Shorter at ITT Creed in Brighton which made telecoms equipment. I had worked at Marconi Radar and he told all about H2S airborne radar used for navigation in his Halifax bombers. He told me that he flew often in F for Freddie / Friday the 13th on raids to Nazi occupied Europe. He was a joker and said he loved his plane and that it had 2 pairs of Bristol. He also said they took it to London and he saw it on display in Oxford Circus. My Dad, Ray Lister, was a Navigator with 158 Sqd at Lissett, joining in Sept 1943. Although most of his 36 Ops were as Navigator to Pilot Officer Strange (The Strange Crew) who flew in “B” Baker, his log book shows he flew in “F” Freddy on 2 occasions. Second was an Op to Ottinger on night of 24 April 1944 as Stand-by Navigator with P/O Smith. This would have been just a few weeks before D-Day and his Ops change from mostly German, to mostly French targets as they would hit Marshaling Yards and other infrastructure. Unfortunately no longer with us, (2002) but was most proud of “Doing his Duty” and was an active member of the 158 Re-unions. My dad was a radio operator on Friday 13th towards the end of her career. I have a smashing photo of him and the rest of the crew, and that dear Halifax. He Used to go to reunions in the 1980s and 1990s. Hi Gillian, thought you might be interested to know that my father gave “Friday 13th” her first service (when known as F for Freddy I think) before she was moved from Leconfield where he was based as a young ground crew member. I’m so sorry to hear about your dad. My dad passed away in 2009. FRiday 13th will always be a part of our family and we are very proud and grateful that she brought dad back safely and is part of our family’s history. We have quite a bit of stuff relating to her, still got dad’s flight records somewhere. Thanks Gillian. Would be interested to read your archives sometime. For now I’m concentrating on my Da’s funeral but you may also be interested to know that we plan a reading by my son (also George) of Eric Sykes poem about ground crew entitled “Three Cheers for the Man on the Ground”.